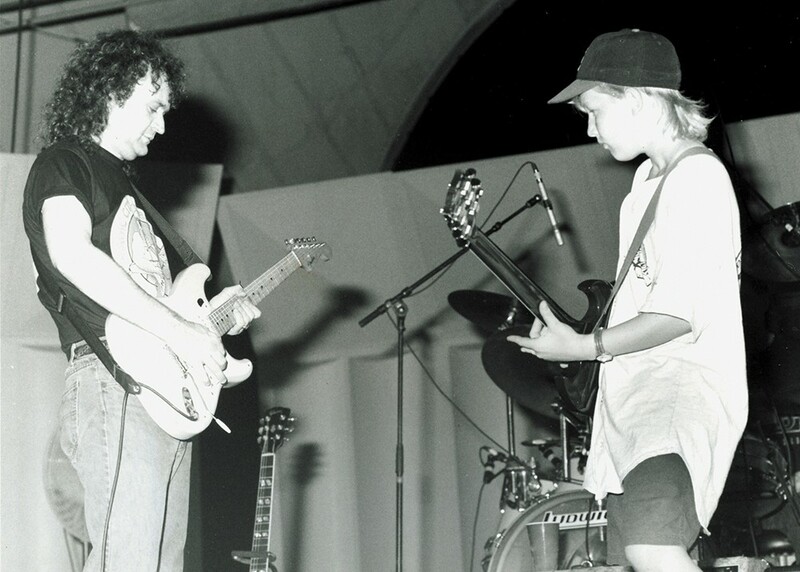 A 14-year-old Derek Trucks jams with Tinsley Ellis back in 1993. One sultry Florida evening in 1993, a lanky, freckled-faced 14-year-old boy, blond hair stuffed under an Atlanta Braves cap, cherry-red Gibson SG slung low over a man-size T-shirt, pitted his slide against high-voltage blues veteran Tinsley Ellis. While Ellis' unruly curls soaked his head, the kid didn't break a sweat. No histrionics, just unnerving focus and eerie precision. Practically Zen. Florida native Derek Trucks picked up his first guitar at 9. By 14 he was homeschooled on the road, sitting in for Duane Allman in his uncle Butch Trucks' band, the Allman Brothers. At that point, it wasn't clear if a boy so young would survive the rigors of a rock 'n' roll lifestyle. Fast-forward 20 years. Despite touring eight months a year, Trucks says this is still where he wants to be. "When it becomes work it's because of outside forces, or somebody is in it for the wrong reasons," says Trucks, now 34. "You got to be able to shed your skin and keep the inspiration in front of you, keep that flame lit." The flame is his 11-piece the Tedeschi Trucks Band, fronted by rootsy vocalist Susan Tedeschi, who is also his wife. After 10 years of marriage and two kids, he attributes much of his success to their "bedrock of musical appreciation" and the fact that "the stage forces you to confront things and keep the communication line open." It doesn't hurt that Tedeschi happens to be a "badass guitar player," adding to the incredible level of talent in his band, whom Trucks considers family. For Trucks, staying grounded means living at the couple's Jacksonville, Fla., home studio, christened "Swamp Raga." It's where he recorded the Grammy Award-winning album Revelator with the band. As far as how the decades of touring, recording and high-caliber collaborations — along with being ranked 16th on Rolling Stone's 100 Greatest Guitarists list — has affected him, he says he's flattered to be in the conversation but believes it's a dangerous road. This enduring, humble style rings true when he plays with guitarists like Eric Clapton, saying there's always something to learn. "[Don't] force your will on it, but let it come to you ... let the space breathe, let the music lead. It's really important to have that musical dialogue," Trucks explains.